I installed a program (Paint.Net) with Choco. At the time, the version was 3.13, but Paint.Net updated itself to 3.15. However, when I run choco outdated, it still thinks 3.13 is installed and wants to (re)install 3.15. Is there a way to synchronize what's in the choco local database of installed packages to the actual current version? This is the free version of choco. This option exists in chocolatey, but only in the paid version. It is called the Sync Command. You may find more information about using it in the above link. A video describing the command can be found on YouTube. Synchronize with Programs And Features (Licensed Editions Only). A free program manager for chocolatey that does syncing is said to be Deployify, which you might try. In a pinch, if you don't want chocolatey to update certain package(s), ignoring them, you may use the choco pin command. 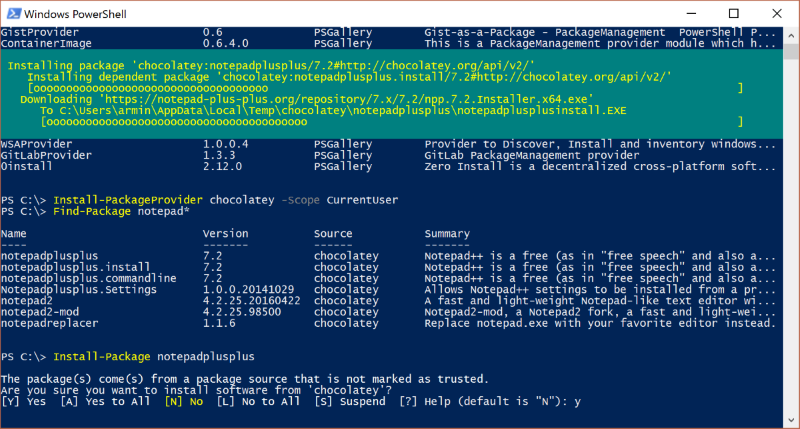 To make Chocolatey aware of installed applications without running the installation scripts, use the parameter -n, --skippowershell, --skip-powershell, --skipscripts, --skip-scripts, --skip-automation-scripts (these are all the same switch). See How To Install or Upgrade a Package Without Running Scripts. You may also interface chocolatey to Microsoft's PowerShell counterpart to the Linux apt-get : OneGet, now renamed to Package management. Package Manager is Microsoft's name, while the underlying open source project is still named OneGet. You would then be able to use PowerShell as the unique interface to both Windows and chocolatey. What’s New in PowerShell: Getting Started with OneGet in one line with Windows PowerShell 5.0. As mentioned in another answer, there is no automatic way in the Open Source version of Chocolatey to update the Chocolatey Package version, based on the version of the application being updated in another way. In a licensed version of Chocolatey, this feature is available. If you want to do the initial install of an application with Chocolatey, i.e. How do you setup an offline Chocolatey instance? Does Chocolatey check whether a program is already the latest version before attempting to upgrade?